The Divisional Patent System is a system in which a section of a patent pending with the JPO (the original application) may be divided and submitted as a new patent. The merit of this system is that the new application, the divisional application, will be handled as an application that was filed on the same date as the original application (the filing date is retroactive). A divisional application can be a provision when: 1. Office action is received for not fulfilling the requirement of unity, because several inventions were incorporated in a patent application 2. Only a portion of the claims are refused, and rights for the other claims are desired quickly. 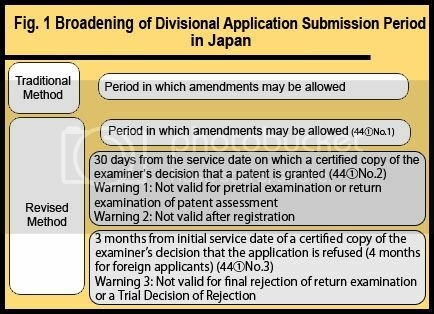 This article explains the broadening of the divisional application submission period in Japan. Traditionally, if a final rejection was received there was no opportunity to amend a patent application where different invention is contained in the specification. However, now even after a patent assessment has been completed, divisional applications are accepted, and therefore a new layer of protection is available for inventions. No matter how limited the scope or narrow the concept of the claims, it is now possible to claim up with broader concepts. We hope you will inform your clients that there is an opportunity for submitting a divisional application during patent assessment to ensure that no parts of the invention have been left unfinished. Please be careful with regard to the following points: 1. The patent assessment mentioned in this article is the first patent assessment, and not the pretrial or return examination involved with an appeal against an examiner's decision of rejection. 2. The procedure is not possible after the patent has been registered in the original patent register, and therefore must be completed before registration fees have been paid. 3. The divisional application must be within the specifications of the current application immediately before it is divided. Regarding 3, please be aware that the scope may be different if the divisional application is submitted during the period amendments to the specification are possible. Therefore, anything deleted from the original application by an amendment cannot be revived. Korea and China also have similar divisional application systems to Japan. In Korea, a divisional application may not be submitted after patent registration is complete (therefore filing must be before payment of registration fees). If an office action is received, a divisional application may be submitted before the office action response deadline (2 months from issuance of the OA). In the event that the application is rejected, a divisional application may also be submitted 30 days after a Notification of an Examiner's Decision of Rejection has been issued. In China, the final deadline to submit a divisional application is 2 months after issuance of the Notification to Grant a Patent Right (unlike Japan and Korea). In addition, a divisional application may be filed 3 months after issuance of a Notification of an Examiner's Decision of Rejection. In this "Lesson" because the time restrictions for divisional applications have been alleviated, we focused on divisional applications after assessment. When using this system, any unfinished parts of the application may be examined, and any unnecessary claims may be removed and abandoned. In our next installment, we will explain divisional applications after the service date of an examiner's decision that the application is refused. Please feel free to contact us if you have any questions or comments regarding the information in this article.